A college scholarship to NYU was all it took for a few guys to start making music together. Aidan Dolan somehow managed to convince his high school to let him apply a year early and was originally accepted into the jazz program before switching to classical composition. Nick Katz was also accepted into the classical composition program but left after a year. Max Yassky stuck out the program and received his degree. “Here’s to not having student loan debt,” Katz said. “Here’s to student loans,” Yassky countered. 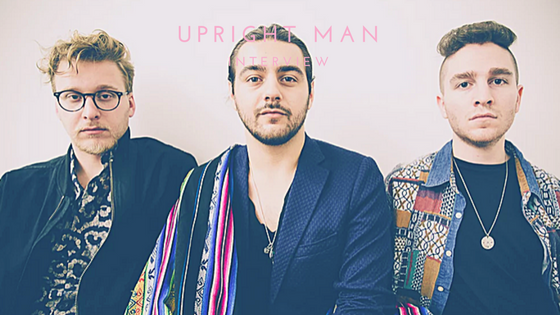 From their initial meeting to the formation of something more permanent, the guys said that Upright Man formed itself to a degree. Their relationship as friends as well as musicians was built on the fact that they saw each other as peers and were all in the same headspace of letting everything flow naturally. By being in that same headspace, their writing chemistry was equally as natural. The “lightning in a bottle” that Yassky refers to it as is the real piece of Upright Man that sets them apart. Each member clearly demonstrates instinctual habits that stem from their time writing together. “We’ve definitely gotten more comfortable with our individual strengths and weaknesses as writers and found ways to contribute and allow the others to shine,” Katz said. Also part of their natural progression is their sound, which compliments their varying tastes. This comes from their advantage of knowing how to communicate with one another. They aren’t afraid to voice their opinions or concerns, and in turn that creates a sound that satisfies everyone. That comfort level with each other as songwriters shows on their self-titled record due out August 18. It started with a few college scholarships, but grew into so much more. Upright Man may have some student loans to pay off, but their initial payoff comes from releasing this record.